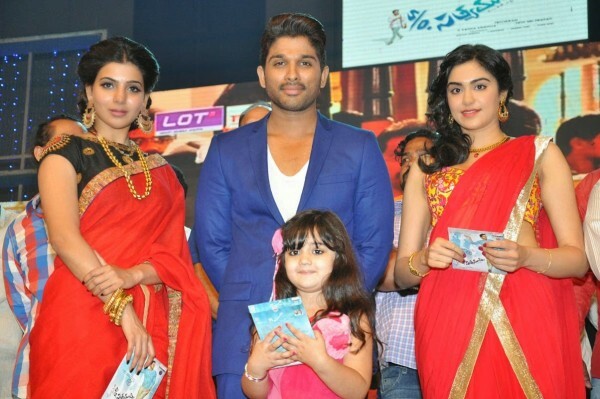 Allu Arjun and Trivikram’s movie Son of Satyamurthy audio has been launched on Sunday in style. Dasari Narayana Rao was the honoured chief guest who unveiled the Son of Satyamurthy music album and handed over the first CD to Bunny’s father Allu Aravind. Beautiful heroines Samantha and Adah Sharma, Rajendra Prasad, Kannada actor Upendra, Brahmanandam, Ali graced the event along with the film’s cast and crew including music director Devi Sri Prasad along with his father writer Satyamurthy and others.